Here are some more ideas for Retirement Scrapbook Layouts. These however are rather unusual, as it is not often that part of a retirement is a Parade, unless you are associated with the military. And this one was even more special as a feature part of the parade was a flyover by the U. S. Navy Blue Angels. 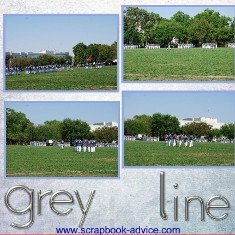 This first scrapbook layout - a single 12 x 12 page - is for the front of the book and contains various snapshots of landmarks around The Citadel during a career there. Scrapbook-Advice.com Tip: This retirement scrapbook idea idea could be used for any retirement page, and you can get friends and co-workers of the retiree to help you collect photos taken from around the work area, both inside and out. 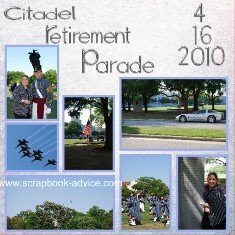 These next 2 Retirement Layouts show photos taken at the beginning of the parade with the Corps of Cadets marching out onto the parade field and the Citadel Pipe band. 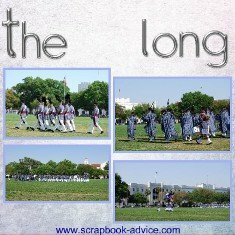 The South Carolina Corps of Cadets from The Citadel Military College of South Carolina is often referred to as "The Long Grey Line". Using Digital Scrapbooking makes it easy to find lettering for titles. These metallic looking letters were carried over to several other pages with a copy feature, which kept the same size and coloring without having to make or cut out additional letters, without having to re-stamp images, and without having to purchase additional sticker sets because I was short a few letters. Just about the middle of the parade, I could see the Corps Adjutant pause and I though he looked at his watch. Just a few seconds later, we could see the Blue Angels approach from the South Side of the Campus. For these digital layouts with a lot of blue sky, I put a lot of the journaling directly onto the photographs and used a blue color that went with the rest of the papers. 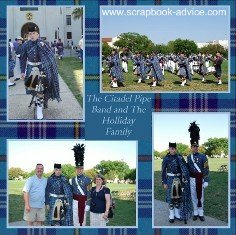 For these last two Retirement Scrapbook Layouts, I used a scan of the Citadel Pipe Band Blue Tartan Plaid. 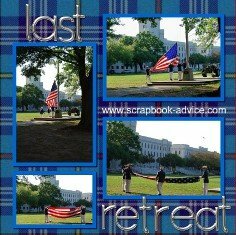 I uploaded the scan into my Digital Scrapbook site at Heritage Makers and enlarged it to cover the 12 x 12 pages to be used for the background. 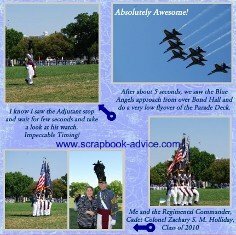 Digital Scrapbook-Advice.com Tip: You can upload any image or photo and "stretch" it to cover the entire page and use if for a background. This is one of my favorite techniques with my digital scrapbooking. 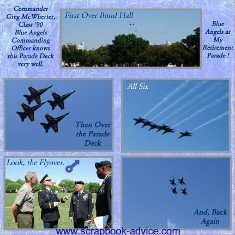 I hope you have enjoyed these Digital Scrapbook Layouts and have picked up a few retirement scrapbook ideas to use for your own.